Personal information that you provide to us, such as your user ID and password, name, email address, telephone number, physical address, birth date, gender or zip code or other information may be collected via the Site. We may receive and store certain types of information whenever you visit the Site. For example, we may collect click-stream data and your IP address. When you open emails from the Site, we may receive a confirmation noting you opened an email from us, if your computer supports such capabilities. We also may keep track of what emails we send you and what emails you may be receiving from us and our subsidiaries and affiliates. Additionally, we keep a record of what types of emails you have opted to and not to receive. You may be asked first to complete a registration form and provide personally identifiable information; you may also be asked to choose a user ID and password in order to take advantage of certain features the Site may choose to offer, including, but not limited to, Newsletters, Contests, Forums or other subscription-based services. We may offer free newsletters to share information with you about the Site, about us and our affiliates and subsidiaries, or about our business partners and advertisers and sponsors. You may receive a newsletter either by registering for a particular newsletter or in conjunction with a special feature or membership for which you have registered on the Site. You may cancel your free email subscription by following the instructions provided in the designated area of certain newsletters or emails. From time–to-time we may request personally identifiable information from you via surveys or voting polls. Participation is voluntary and you will have the opportunity to decide whether or not to disclose information. At times, you may have to register to vote or to take part in a survey. We own the information collected via this Site. As applicable, the information you provide to us may be used to: contact you about the Site; contact you relating to your membership status; confirm or fulfill an order you have made; monitor or improve the use of the Site; customize the advertising and content you see; monitor compliance with our terms and conditions of use of the Site; provide special offers to you from us and/or their respective affiliates and subsidiaries and other third parties; send you promotional material on behalf of our business partners; inform you of a prize you have won. At times, we may share your personally identifiable information with others for various purposes. The following outlines the ways in which your information may be shared with others: Agents: We employ other businesses, certain services and individuals to perform functions on our behalf. Examples include fulfilling orders, sending e-mail, removing repetitive information from customer lists, Site analysis, analyzing data, providing marketing assistance, processing credit card payments, and providing customer service. These entities have access to personally identifiable information needed to perform their functions, but may not use it for other purposes. We may send offers by email to you on behalf of other partners. When we do this, we do not give that partner your name and address. If you do not want to receive such offers, you may opt out in response to the email. We may share aggregate information such as demographics and Site usage statistics with advertisers, sponsors or other organizations. When this type of information is shared, the other parties do not have access to your personally identifiable information. We may share your information (including, without limitation, personally identifiable information) with our subsidiaries and affiliates. The Site may be sold along with its assets, or other transactions may occur in which your personally identifiable information is one of the business assets transferred. In such a case, your personally identifiable information, which we have gathered, may be one of the business assets we transfer. In the event we are required to respond to subpoenas, court orders or other legal process your personally identifiable information may be disclosed pursuant to such subpoena, court order or legal process, which may be without notice to you. The Site may make chat rooms, forums and message boards available to its users. While you are required to register with the site for access to these areas, you are not required to provide any personal information when using these areas but you may choose to do so. If you post personal information online, it will be publicly available and you may receive unsolicited messages from other parties. We cannot ensure the security of any information you choose to make public in a chat room, forum, or message board. Also, we cannot ensure that parties who have access to such publicly available information will respect your privacy. Please exercise extreme caution when deciding to disclose personal information in these areas. This Site incorporates reasonable safeguards to protect the security, integrity, completeness, accuracy and privacy of the personal information that we may collect and we have put into place reasonable precautions to protect such information from loss, misuse and alteration. Certain personally identifiable information, such as credit card information, is transferred to our computers utilizing encryption software. Only those employees who need access to your information in order to do their jobs are allowed access. Our security policies are reviewed periodically and revised as required. The Site is a general audience site. We do not currently collect any personal information from children under the age of thirteen on the Site. If in the future, we knowingly collect personally identifiable information from children, we will do so in compliance with the Children’s Online Privacy Protection Act of 1998 (15 U.S.C. 6501 et seq.) including, without limitation, obtaining necessary parental consents. OLER FITNESS DOES NOT PROMISE THAT THE SITE OR ANY CONTENT, SERVICE OR FEATURE OF THE SITE WILL BE ERROR-FREE OR UNINTERRUPTED, OR THAT ANY DEFECTS WILL BE CORRECTED, OR THAT YOUR USE OF THE SITE WILL PROVIDE SPECIFIC RESULTS. THE SITE AND ITS CONTENT ARE DELIVERED ON AN “AS-IS” AND “AS-AVAILABLE” BASIS. ALL INFORMATION PROVIDED ON THE SITE IS SUBJECT TO CHANGE WITHOUT NOTICE. 40+ FITNESS CANNOT ENSURE THAT ANY FILES OR OTHER DATA YOU DOWNLOAD FROM THE SITE WILL BE FREE OF VIRUSES OR CONTAMINATION OR DESTRUCTIVE FEATURES. 40+ FITNESS DISCLAIMS ALL WARRANTIES, EXPRESS OR IMPLIED, INCLUDING ANY WARRANTIES OF ACCURACY, NON- INFRINGEMENT, MERCHANTABILITY AND FITNESS FOR A PARTICULAR PURPOSE. 40+ FITNESS DISCLAIMS ANY AND ALL LIABILITY FOR THE ACTS, OMISSIONS AND CONDUCT OF ANY THIRD PARTIES IN CONNECTION WITH OR RELATED TO YOUR USE OF THE SITE AND/OR ANY 40+ FITNESS SERVICES. YOU ASSUME TOTAL RESPONSIBILITY FOR YOUR USE OF THE SITE AND ANY LINKED SITES. YOUR SOLE REMEDY AGAINST 40+ FITNESS FOR DISSATISFACTION WITH THE SITE OR ANY CONTENT IS TO STOP USING THE SITE OR ANY SUCH CONTENT. THIS LIMITATION OF RELIEF IS A PART OF THE BARGAIN BETWEEN THE PARTIES. 40+ Fitness reserves the right to do any of the following, at any time, without notice: (1) to modify, suspend or terminate operation of or access to the Site, or any portion of the Site, for any reason; (2) to modify or change the Site, or any portion of the Site, and any applicable policies or terms; and (3) to interrupt the operation of the Site, or any portion of the Site, as necessary to perform routine or non-routine maintenance, error correction, or other changes. Except where prohibited by law, in no event will 40+ Fitness be liable to you for any indirect, consequential, exemplary, incidental or punitive damages, including lost profits, even if 40+ Fitness has been advised of the possibility of such damages. You agree to indemnify and hold 40+ Fitness, its officers, members, directors, shareholders, predecessors, successors in interest, employees, agents, subsidiaries and affiliates, harmless from any demands, loss, liability, claims or expenses (including attorneys’ fees), made against 40+ Fitness by any third party due to or arising out of or in connection with your use of the Site. 40+ Fitness may disclose any information we have about you (including your identity) if we determine that such disclosure is necessary in connection with any investigation or complaint regarding your use of the Site, or to identify, contact or bring legal action against someone who may be causing injury to or interference with (either intentionally or unintentionally) 40+ Fitness’ rights or property, or the rights or property of visitors to or users of the Site, including 40+ Fitness’ customers. 40+ Fitness reserves the right at all times to disclose any information that 40+ Fitness deems necessary to comply with any applicable law, regulation, legal process or governmental request. 40+ Fitness also may disclose your information when 40+ Fitness determines that applicable law requires or permits such disclosure, including exchanging information with other companies and organizations for fraud protection purposes. You agree that 40+ Fitness may, in its sole discretion and without prior notice, terminate your access to the Site, for cause, which includes (but is not limited to) (1) requests by law enforcement or other government agencies, (2) a request by you (self-initiated account deletions), (3) discontinuance or material modification of the Site or any service offered on or through the Site, or (4) unexpected technical issues or problems. You agree that all matters relating to your access to or use of the Site, including all disputes, will be governed by the laws of the State of Florida, USA. This Agreement has been delivered at and shall be deemed to have been made and entered into in Pensacola Beach, FL, USA. Accordingly, the rights and liabilities of the parties shall be determined in accordance with the laws of the State of Florida, without regard to its principles of conflicts of laws. The parties agree that the exclusive jurisdiction and venue for the resolution of any dispute arising from or relating to this Agreement shall lie in the Escambia County Court for the State of Florida, sitting in Pensacola, Florida. Each party irrevocably consents to the service of process in any such dispute if served in accordance with the notice provisions contained herein. 40+ Fitness administers and operates the wellnessroadmapbook.com Site from its location in Pensacola Beach, FL; other 40+ Fitness sites may be administered and operated from various locations outside the United States. Although the Site is accessible worldwide, not all features, products or services discussed, referenced, provided or offered through or on the Site are available to all persons or in all geographic locations, or appropriate or available for use outside the United States. 40+ Fitness reserves the right to limit, in its sole discretion, the provision and quantity of any feature, product or service to any person or geographic area. Any offer for any feature, product or service made on the Site is void where prohibited. If you choose to access the Site from outside the United States, you do so on your own initiative and you are solely responsible for complying with applicable local laws. 40+ Fitness provides access to 40+ Fitness international data and, therefore, may contain references or cross references to 40+ Fitness products, programs and services that are not announced in your country. Such reference does not imply that 40+ Fitness in your country intends to announce such products, programs or services. Any feedback you provide at this site shall be deemed to be non-confidential. 40+ Fitness shall be free to use such information on an unrestricted basis. Copyright © 2018 40+ Fitness, LLC. 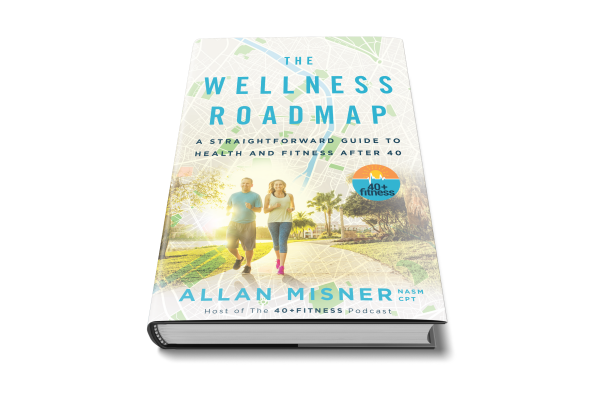 Sign up to get updates on The Wellness Roadmap book.